Bake up a batch of lemony, light, and fluffy clouds of meringue. 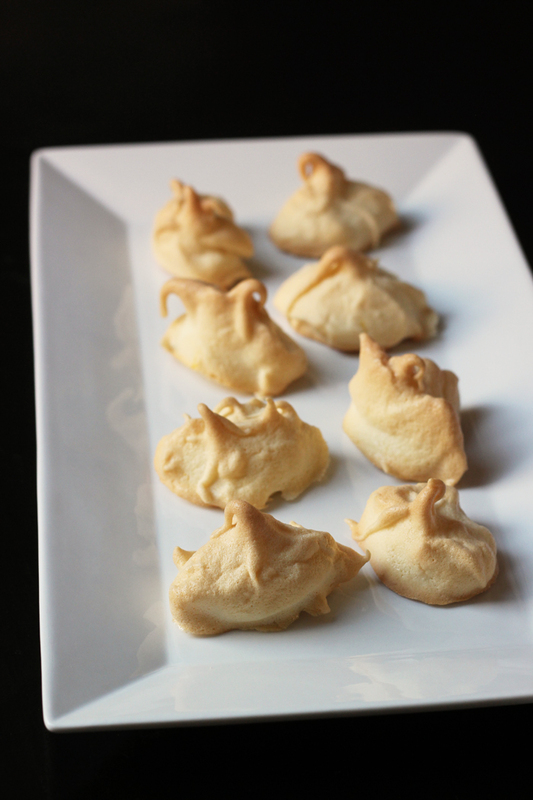 These Lemon Meringue Cookies are a fun addition to your cookie plate. 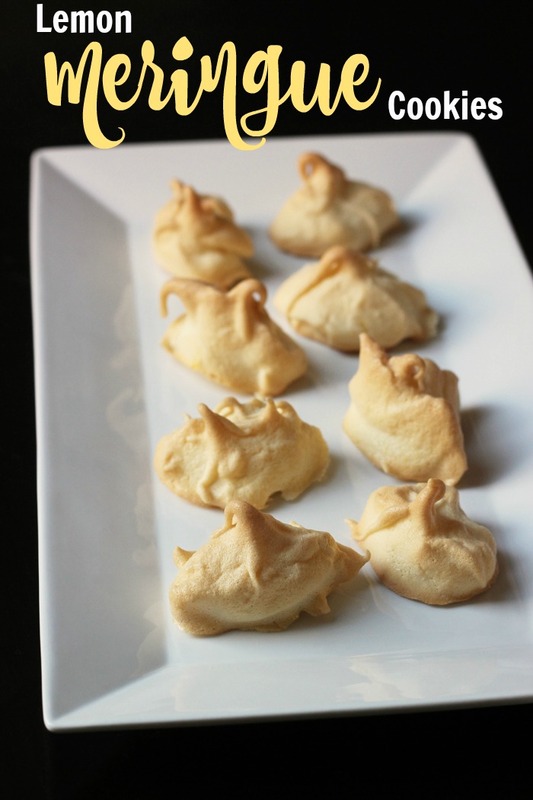 Have you ever made Meringue Cookies? I first discovered them years ago when we had friends who ate gluten and dairy free. They were good with sweets, but sweets were hard to come by since so many goodies include either gluten, dairy, or both. I learned about meringue cookies and found a perfect dessert to serve our friends. Since then, I’ve played around with the basic meringue cookie recipe, adding in different spices, chocolate, nuts, and citrus zest. When we were in England earlier this year, one of my favorite desserts in our travels was a Lemon Meringue Sundae at Zizzi. I’ve been scheming how to recreate it at home, and it couldn’t be easier! The process starts with these Lemon Meringue Cookies. 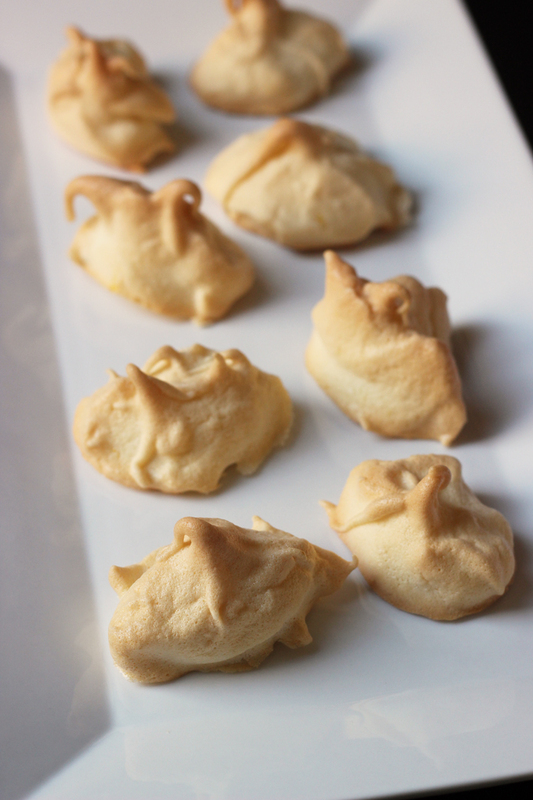 Meringue Cookies are not complicated in the slightest. Beat eggs whites, cream of tartar, and salt until stiff peaks form, add sugar and flavorings, dollop onto a baking sheet, bake. And voila! The result is light and fluffy, crisp, melt-in-your-mouth goodness. These are a super easy cookie to add to your holiday offerings. Store them separately from your other cookies so that they stay crisp. And be sure to let your gluten- and dairy-free friends know that they can indulge to their hearts content. What does cream of tartar do for meringues? Egg whites can be prone to weeping, but cream of tartar is an acid and it can help to stabilize the egg whites and make them sturdier. By adding cream of tartar your egg whites will be less prone to weeping. Are meringues supposed to be chewy? Meringues should be crisp and have a light airy interior. So, no they shouldn’t be chewy. Too much moisture can result in a chewy meringue. The trick is to leave the meringue cookies in the oven after baking. One trick for a foolproof meringue is to pop them in the oven and let them crisp up again for 10 minutes. How long do meringue cookies last? The good thing about meringue cookies is that they can last for up to 2 weeks, which means they can be made ahead of time. Just be sure to store them in an airtight container! Stock up on ingredients when they are on sale. The holidays are a great time to stock up on baking ingredients, in this case sugar and eggs. If you need to make some substitutions or omissions, you can skip the lemon zest. It’s not critical and if you don’t have any lemons or they aren’t on sale, it’s not a huge deal. You can use another type of citrus zest or stir in some cinnamon or shaved chocolate. There are lots of variations. Make sure you use up the yolks. No use wasting eggs. You can make your own lemon curd (the filling from this recipe), make a few batches of these Thick and Chewy Chocolate Chip Cookies, or make Homemade Mayonnaise. stand mixer or hand mixer – You don’t want to whip the egg whites by hand. These gluten and dairy free lemon cookies are like little clouds of heaven! Preheat the oven to 250 degrees. Line two sheet pans with parchment paper or silicone baking mats. In a large mixing bowl, beat the egg whites, cream of tartar, and the salt until stiff. Continue beating, adding the sugar a little at a time, until you have glossy peaks. Beat in the vanilla extract and the lemon zest. Dollop the mixture onto the prepared baking sheets, leaving at least an inch between cookies. Bake for 45 minutes. Allow the cookies to dry in the oven for several hours or overnight. Once cooled, store in an airtight container. How much of a shelf life do these have? I would want to mail them. Unfortunately, not very long. I’d say 3 days?